worth the extra effort. Canned cannellini beans are a bit too soft for my taste; however, you can use them in a pinch. Ricotta salata and pecorino are wonderful alternatives to Parmesan. In a small bowl, whisk the zest, lemon juice, shallot, garlic, and 1/8 tsp. salt. Slowly stream in the oil while you whisk quickly until combined. Season to taste with more salt. 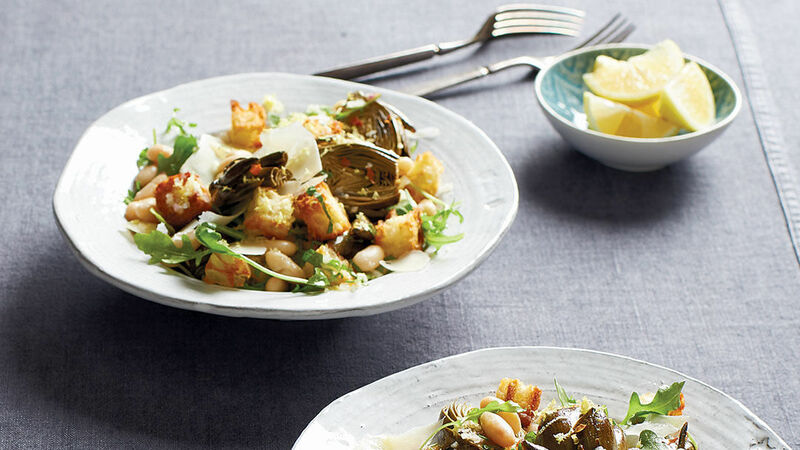 Prepare the artichokes for roasting, cutting them lengthwise into quarters and placing the pieces in the lemon water. Drain the artichokes, leaving them slightly damp, and toss with 2 Tbs. of the oil, the pepper flakes, and 1/4 tsp. salt. Spread them cut side down on a large unlined rimmed baking sheet, and roast until they begin to brown, about 15 minutes. Toss the artichokes, and spread them out again, leaving room between them. Cook until they are crisp and golden-brown all over, another 10 to 12 minutes. Meanwhile, put the ciabatta in a medium bowl with the remaining 2 Tbs. oil and two generous pinches of salt, and toss until= evenly coated. Spread the bread on a large rimmed baking sheet, and bake, tossing after 10 minutes and continuing to toast until golden and crisp, 2 to 5 minutes more. Let cool completely. In a large shallow serving bowl, combine the dressing and beans. Add the arugula, mint, and three-quarters of the cheese, and toss gently. Add the toasted bread and toss again. Fold in about half of the artichokes. Season to taste with salt. Top with the remaining artichokes and cheese, and a dusting of the reserved lemon zest. Let the salad sit for 20 to 30 minutes before serving with lemon wedges on the side. Wonderful early spring dish. Per the recipe, I started with dried beans...though I was thinking it would also be good with fresh favas, which come in around the same time as artichokes. I turned this into a complete supper by combining with another FC recipe -- crispy chicken breasts with lemon and capers -- which I sliced and fanned out over the salad on a large platter. Perfection!